It is time to end the ridiculousness. Every time I try to ascertain via the internet whether the leftovers in my fridge are still good, I get the same BS. With the exception of a microscopic number of websites, pretty much all I can get is the party line from either the FDA or the USDA, and considering who these institutions (organizations?) actually are and the level of corruption and underhanded dealings they traffic in, I do not believe the recommendations. It’s not just that I don’t believe them on principle, but I know for a fact based on repeated personal experience that the recommendations I am reading are hogwash. (I wanted to say horse sh1t, but didn’t want to be too vulgar). So I am here to pass on what I have gleaned from my daring. 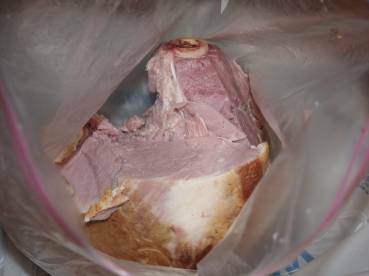 Let’s start with what got me on this rant in the first place tonight: the Easter ham. So right now it is Tuesday, the 10th day from Easter Sunday. There is leftover ham in my fridge. I’m not sure if I should eat it or not, so I’m not going to at this stage of the game. It smells fine and looks fine, and there doesn’t appear to be any slimyness coating the outside. According to the experts, and 98% of the websites out there, it is good in the fridge for 3-4 days and then should be discarded no questions asked, the end. HOWEVER, I know for a fact that it will keep in my fridge for 7 days, no need to even question it. Point in case: I just ate some this past Sunday, and if I was going to get food poisoning from it I am more than confident the symptoms would have shown up by now. Of course I always perform the smell test before chowing down, just in case there is some anomaly going on. I’ve had food poisoning and it is something to be avoided at all costs. This isn’t the first – or the second – time I’ve played this “beyond three days in the fridge” form of Russian roulette. I’ve been doing it for years. I also have some Oscar Meyer Deli Fresh turkey breast lunch meat in the fridge that is 11 days old, I ate 3 pieces today. Not sure how long it’ll last but you can bet I won’t be afraid to eat it tomorrow. My thinking is this: meat stinks when it is bad. I have had meat go bad in the fridge, I was a bachelor at one time. It also often times changes color when it starts going bad. On top of that, lunch meat in particular is loaded with preservatives in order to preserve profit margin potential for the heartless corporations that put it on the market. Cooked bacon: I can’t even fathom a guess, but I know 2 weeks is nothing. I’ve cooked bacon after sitting in the fridge for two weeks uncooked. (Store bought, prepackaged, that is). I can’t speak on deli products because I’m not rich like that. The real joke is that the other guys’ websites even parrot the recommendation it should be thrown it if it’s been in the freezer for 2-3 months. The freezer!! Hello???? Nothing goes bad in the freezer. It might loose some deliciousness, but it is safe to eat.